This law office handles all types of personal injury cases (see the list below). We work with clients injured in car and motorcycle accidents, at local businesses, and more. As an experienced Orlando personal injury lawyer, our knowledge of alternative dispute resolutions helps us in quickly and effectively communicating with insurance adjusters and the defense counsel on the liability of their clients and the value of a case. However, we are not limited to these practice areas. We litigate on behalf of all types of accident and injury victims. If you or a loved one has been harmed by the negligence of another person or business, trust our Orlando personal injury attorneys to fight on your behalf. If you are not represented by an Orlando law firm that tries cases, your case will not receive its full value. 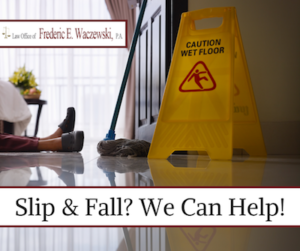 When you hire the Law Office of Frederic E. Waczewski, P.A., we treat every case as if it is going to trial. We perform a proper investigation and develop a plan from the very beginning. This formula will enable us to make an outstanding demand for you once we have accumulated all of your medical records and the facts surrounding your accident, as well as taking into account the limitations you will have for the rest of your life. Personal injury cases are complex, and cause much devastation to our clients and those around them. Contact an Orlando Personal Injury Lawyer today to get started on the path to receiving the compensation you rightly deserve.